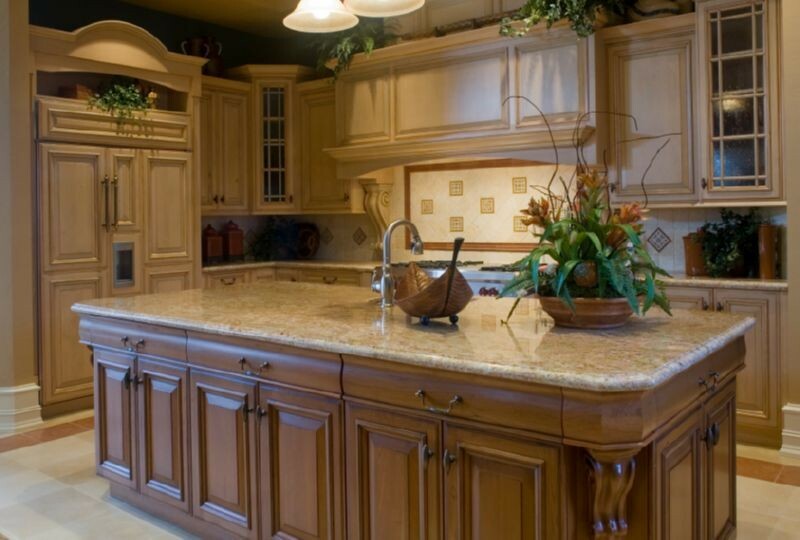 Giallo Ornamental evokes a sense of warmth welcoming and she is the safe bet design in the kitchen remodeling. These two characters make her very popular since 2006. She is always on the stage to make a nice bow after her performance for her fanatics. Giallo Ornamental granite is a Brazilian sweetheart. She is from the Santo city of Brazil and she is also known as Giallo Santo. Her other names are Golden Ivory, Amerello Ornamental. Her other family members are Giallo Veneziano, New Venetian Gold, Giallo Imperial and Santa Cecilia. Giallo Ornamental granite differs from Venetian Gold and Santa Cecilia by having less dark browns and more golden tones. Giallo Ornamental granite has gray, bronze, beige and very light brown specs on honey yellow base. She has a nice calming flow beside her secret keeper characteristics. She does not like to show any dust or crumbs in your busy kitchen. As all light color granites, she needs to be sealed yearly to decrease the water adsorption. This lovely stone can be seen in darker version, too. Giallo Ornamental light and Giallo Ornamental dark is still on the top rank. Please make sure which one do you prefer in your kitchen remodeling. Her backsplashes are always natural color mosaic or subway travertine or ceramic tiles, but as a novelty the cupper tone glass matchstick backsplashes can be chosen. Since she has a calming action, she carries diagonal backspash layout very proudly. Cabinets colors that balance out with Giallo Ornamental granite countertop is almost endless. The combination of white with umber highlights, cotton soft white, cream and yellow cabinets with dark version of the granite give the best results. With light version, espresso, honey, twilight espresso, gray, gray -green, mocha glaze, warm brown, dark mahogany, auburn maple glaze, and chocolate brown cabinets. You can have an idea by seeing these pictures in your kitchen remodeling process. If you need some backsplash ideas when using dark cabinets or white cabinets, you may visit my other articles. Picture Credit: Madisonparkhomes. Giallo Ornemental with with white cabinets. Soft colors and nice clean feeling. I like the copper color faucet. Picture Credit: Nicola Interiors. With mocha glazed maple cabinets and honey tumbled marble subway tiles, this kitchen looks amazing. Molding around the ceiling light is an extraordinary mesmerizing. Picture Credit: CounterEdge. Such a cozy , warm and homey kitchen. Just right it should be . Eased edge stone looks wonderful. Picture Credit:Constructionresources. Island with Giallo Ornamental, very pastel grayish gray cabinets and wall colors. Sweet and smooth. Giallo Ornamental with Dark Cherry Cabinets and Travertine Backsplash, Copper Sink is a Bonus! Picture Credit: Dexter Builders. Dark cherry cabinets and copper sink, bronze fixtures are like a show piece with Giallo Ornamental countertop. A safe bet design. I am looking forward to seeing your valuable comments and pictures. Thank you for reading my article. If your mind is still curious about granite material, I may suggest you to check the Granite Countertop : Kitchen Countertop Materials article of mine.